Made by American Photo Player Company in California, United States of America, c.1918. In the early days of silent motion pictures, it was realised that background music had a great influence on the audience. 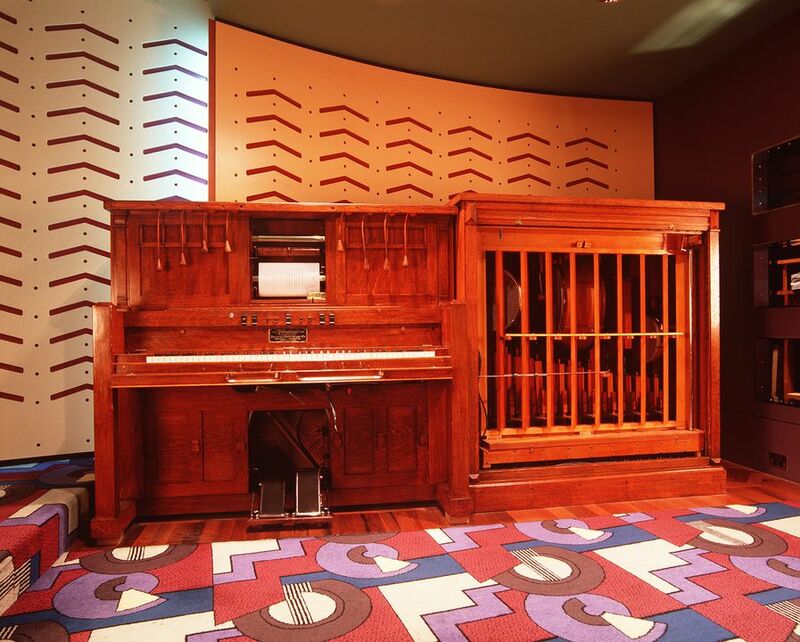 Before movies had sound, many picture theatres had special ‘player pianos’ to reproduce music mechanically from piano rolls. The music was meant to accentuate the mood of the film. Fotoplayer, Style 20, American Photo Player Company, Berkeley, California, c.1918. Style 20 fotoplayer featuring an 88 note keyboard, 4 piano pedals, 5 stop rockers and 4 effect buttons (above the keyboard) with 2 spool boxes in fron mounted vertically. The side cabinet has an ornamental front backed with faded orange cloth. It contains organ pipes, bass drum, snare drum, 2 cymbals, tom-tom drum, 1 chime, train whistle, pistol shot effect and castanets. Both the piano and the side cabinet are veneered in oak. Plaque above keyboard: "fotoplayer" / Manufactured By / American Photo Player Co. / New York, N.Y. - Berkeley, Cal. / U.S.A."
Purchased by Mr Percy Middleton Wells in 1929 for the Goolwa Centenary Hall but never used due to the advent of talking films. Original owner unknown. Purchased by Mr Percy Middleton Wells in 1929 for the Goolwa Centenary Hall. Removed around 1960 by Mr C.Mau, a piano tuner. Restored and donated to the museum by the Mastertouch Piano Roll Company in the 1980s. This object is currently on display in Kings Cinema at the Powerhouse Museum.